Max thrust at lift-off is 5.1 million pounds or 2300 metric tons. First mission will run at 92%. 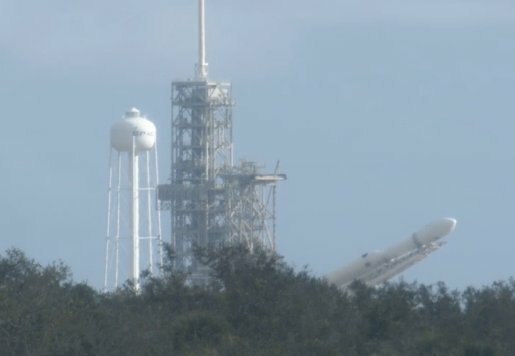 Falcon Heavy launching from same @NASA pad as the Saturn V Apollo 11 moon rocket. It was 50% higher thrust with five F-1 engines at 7.5M lb-F. I love that rocket so much. Can confirm that it is already mated to the payload adapter. Another one Presumably final checks before rollback. I'm not there, but I have it on good authority the TEL is in the HIF at this time. Great find. Higher res attached. We understand the big rocket is going to be on the pad very soon, or at least rolled out (fit checks can take a fair amount of work). Will be the full stack, per the fit check requirements. Photos, in here (always link), when available. Discuss what the photos show in the discussion thread to keep this thread clean. Remember, this is not the static fire, this is a fit check. 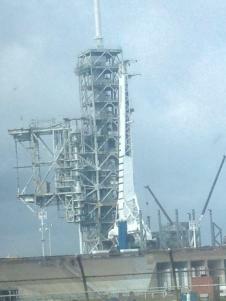 Static Fire will be about a week away.